I’m sure fried food is exactly what you thought you’d see here today. But, you know, we’re only human and sometimes we fry things. Well, to be clear, Jack fries things. I sit back with a glass of wine and watch. It’s a hard job, but someone’s gotta make sure he doesn’t burn the house down. Pictured is shrimp, but he also made a tofu version using the same method. I mixed up a tangy sauce by pureeing mango with kewpie mayo. (You could use regular mayo or even vegenaise if mayo isn’t your thing). We ate these with sliced mango, shredded cabbage and some chopped chives. 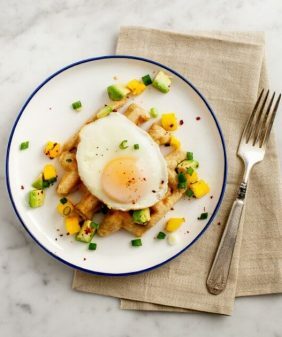 This recipe is part 3 of my Mangover series for the Mango Board. Make the mayo: Mix everything together in a food processor. Taste and adjust seasonings. Chill until ready to serve. To fry the shrimp: In a small bowl, stir together the salt, garlic powder, onion powder, oregano, paprika, cayenne and pepper. Toss it with the raw shrimp and set aside. In another small bowl, combine the egg and milk. In a medium bowl, stir together the panko and cornmeal, with some salt and pepper. Over medium heat, heat a medium sized skillet with about ½ inch canola oil. Batter the shrimp, dipping each into the egg mixture, then roll in the panko/cornmeal mixture. Fry for about 45 seconds per side, or until golden brown. Turn down the temperature of the oil as needed if it gets to hot. Place fried shrimp on a paper towel to drain off excess oil. WOW WOW WOW. I love fish po boy and these look out of this world!! Definitely going to make them this summer. The addition of the mango is genius. I idea of mango mayo is so good. Combination of spice and subtle sweetness must be this sandwich a real winner. 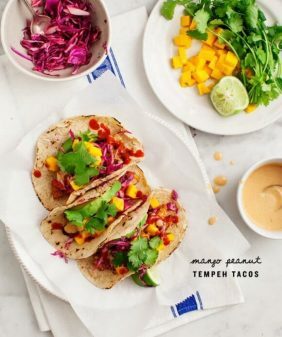 I am going to try this way and make some more mango mayo to try with Indian inspired mango chicken sub! sounds delicious! I love indian spices & mango together. Po’ Boys are my weakness. And so is drinking a glass of wine while watching a man work. Can you please explain how to properly slice a mango? I am always left with a sloppy, slippery, juicy mess (a delicious mess, but it is not servable). Also, your website is my favourite dinner-idea resource right now. I absolutely love what you do! For this I made my sliced as small as I could, and then after I scooped them out, I sliced them a little bit thinner. (which wasn’t totally necessary, just made it look nicer for the photos). Also, after I sliced the pretty slices, I trimmed off any remaining fruit bits and used that to puree into my sauce. 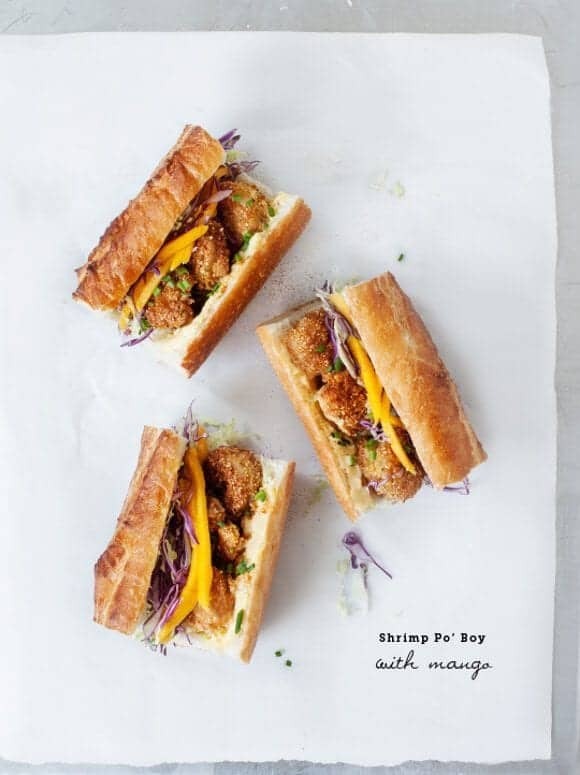 Po Boys with Mango! That is my kind of Po boy!! YUM! Oh my, they look stunning! Bookmarking this for the tofu version for my vegetarian daughter. Wish I had someone who’d fry it though – while I drank wine! your photos are insanely gorgeous. i will make this for my daughter, she is a huge shrimp fan. i am just a starter blog, but would love for you to check it out if you have time! My husband and I just got back from a trip to New Orleans, and we have been craving a po’boy since! 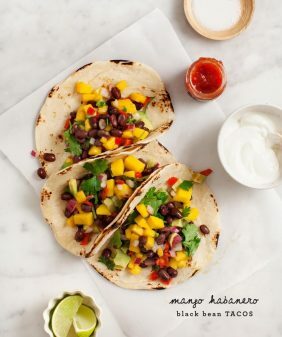 These look delicious – I love the addition of mango. These will be made this week! I love this! 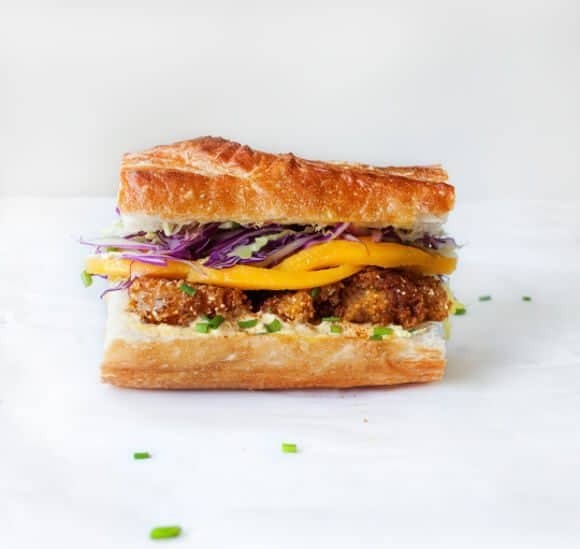 Crispy fried shrimp or tofu with tangy mayo in a baguette? That’s heaven. The words “tofu po’boy” just blew my mind. I can’t wait to try this! WOW, this looks amazing. Out of my list of things worth frying shrimp is up there on the list only under okra and oysters. I am on a shrimp kick right now and can’t wait to try out these bad boys! Love this inventive spin on a typical po’boy — and your combo of panko and cornmeal for extra crunch, yum! 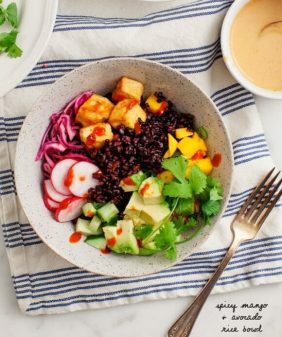 We made it the same way as the shrimp, just sub tofu instead! Our breading method does have egg though (I’m not sure if you’re vegan). You can skip the egg if you want, the breading just doesn’t stick as well. thanks 🙂 just don’t start that broiler and walk away! 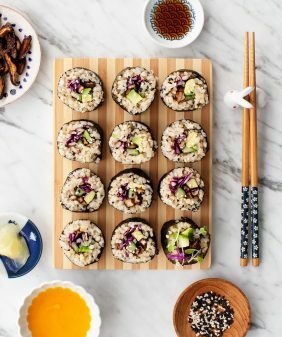 I just made these for lunch, and they were absolutely delicious. Seriously, stop whatever you are doing and go make this sandwich! is a minute-thirty really enough to cook the raw shrimp? Shrimp cooks pretty quickly. Depending on the size of yours, you might want to test fry your first one. well, i made this last night and it was delicious! thanks for the great recipes. I made these tonight! Everyone loved them! I was making them for four people in total and got 24 shrimp in total. I probably would get even more shrimp next time if I’m making them for that many people. It’s such a quick recipe which was great! I also doubled the recipe for the spice rub since I knew I had more shrimp than the recipe called for. I think I should’ve left out the cayenne for the second time though because it was a lot of heat for me (I’m probably just a baby though because everyone else loved it) Also, make sure you put plenty of sliced mango on it because the sweet and refreshing mango is an amaaaazing match for the heat of the shrimp. I served watermelon as a side with it, which was also a great way to cool off the tongue from the heat. 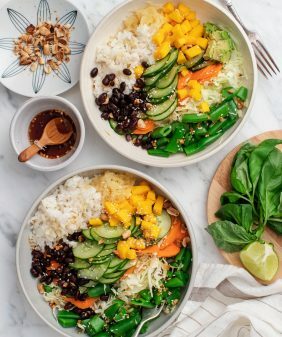 This recipe is AMAZING and not too much work (especially if you ask for the store that you’re buying the shrimp at to unshell and devain the shrimp for you). I definitely recommend giving it a try!